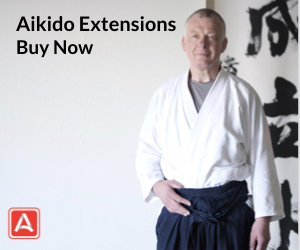 While international aikido seminars are fairly common in the rest of the world, they are somewhat of a rarity in Japan. 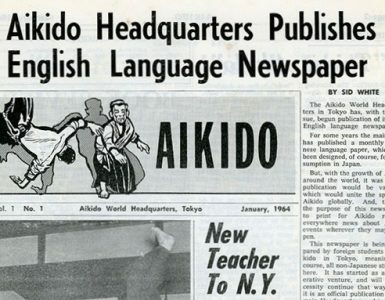 Indeed, except for the Congresses of the International Aikido Federation, which are held every four years, one could be hard pressed to think of another international event of a comparable scale held on the archipelago. 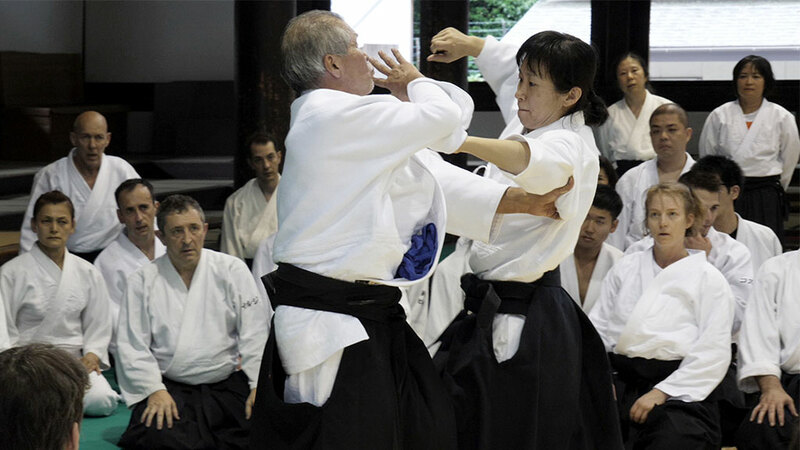 For the past few years, Aikido Kyoto, which is a relatively new and small dojo, has taken it upon itself to challenge this status quo and, after some humble beginnings, the event that it hosts every year at the beginning of June has now become one of Japan’s most attractive gathering opportunities for aikidoka of many nations. 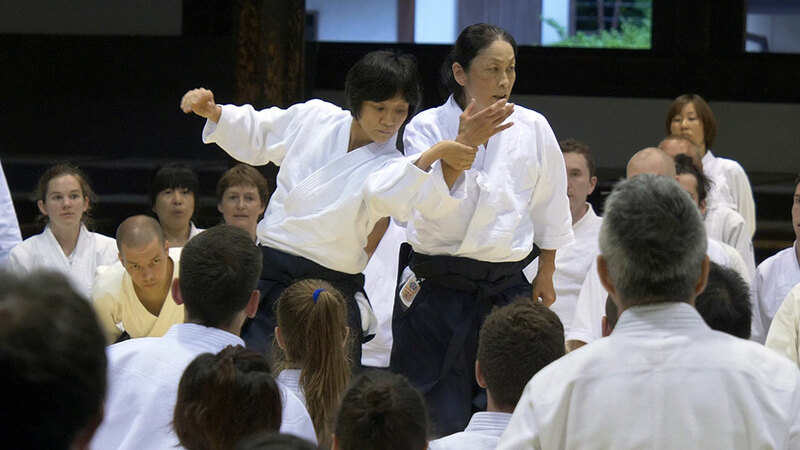 This year’s event felt all the more special as it celebrated the 15th year of the dojo, which was established by Okamoto Yoko [read an interview here]. 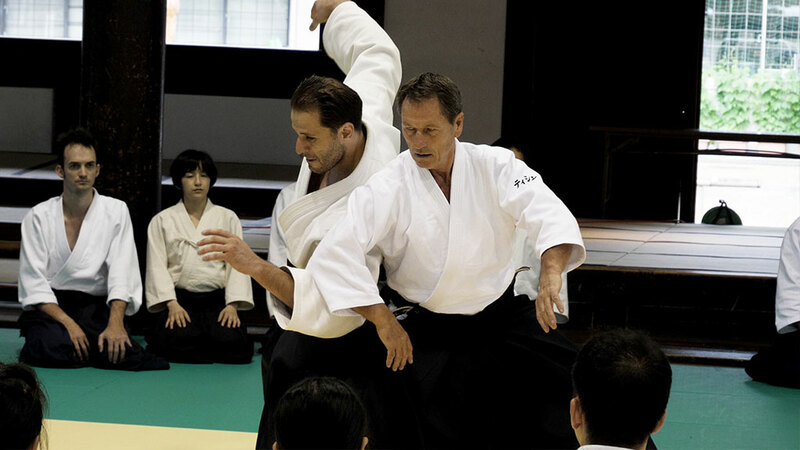 This year, Miyamoto Tsuruzo [read an interview here] and Christian Tissier [read an interview here], both 8th dan Aikikai Shihan, took the lead. 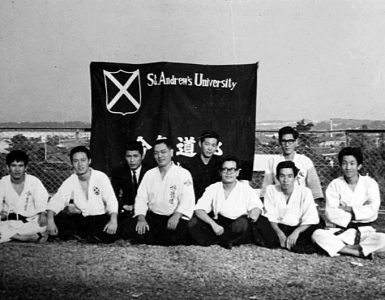 The first edition of this annual seminar was headed by Yasuno Masatoshi Shihan in 2004 and attracted about 80 people. Since then, attendance has grown to such an extent that pre-purchasing tickets has become necessary in order to secure a place. This year, the organizers set themselves a maximum number of 360 attendees through the weekend and the maximum capacity was reached almost two months before the seminar. Participants came from 30 countries and non-Japanese foreigners accounted for about 40 percent of them. This resounding success is not the only superlative that can be assigned to the event as the location is itself, well, quite legendary. The seminar always takes place in the Kyoto Butokuden, located on the grounds of the Kyoto Prefecture Budo Center, near the Heian-Jingu shrine in the eastern part of the city. The impressive wooden structure was built in 1895 as the main training ground for the activities of the Dai Nippon Butokukai, a defunct state organization whose purpose was to develop and promote the practice of budo in Japan. Training in such a place, in a historical city like Kyoto, suffices by itself to inspire a sense of awe and respect, and practitioners from Japan and abroad often comment on the fact that here more than in any other place, they feel in tune with the the essence of their discipline as a life approach or way (道, michi). The technical level of what the high-ranking Shihan invited by Okamoto Shihan demonstrate is exceptional of course, but the majestic hall and its large windows that let the wind and the quiet outside atmosphere (often rainy in that season) permeate the practice itself contribute to further enhance the mastery of what is being presented. This year’s event feels all the more special to me as it is also meaningful on a personal level. It marks the tenth year since my first encounter with Miyamoto Shihan. Miyamoto Shihan is the teacher who first talked to me and called me as uke at the Hombu Dojo, and I have been fortunate enough to become rather close to his group of students. Obviously, Tissier Shihan has been a major influence ever since childhood when I saw his demonstrations on French TV, which later inspired me to take up aikido. His incredible life story prompted me to follow his steps in Japan, and nowadays I am grateful for his benevolent support of my practice and various endeavors. 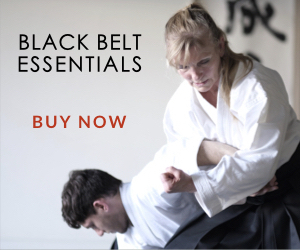 All through the event, classes were taught alternately by Miyamoto Shihan and Tissier Shihan, with one special class on Friday afternoon led by our host, Okamoto Shihan. The contrast between the teaching styles of the two main sensei was as sharp as it was conducive to deep reflection, in particular in terms of understanding the difference between form and substance. It was indeed wonderful to see the respective students of each teacher trying to wrap their minds around the unusual techniques that the other sensei was demonstrating. Perhaps more than in any other international event I have ever attended, I witnessed practitioners trying to really carry out what was shown instead of falling back into their zone of comfort. It was really inspiring seeing practitioners, including numerous high-ranking 5th or 6th dan, take turn in helping each other out through the material. This openness and good will alone made the event well worth attending. The presence of a number of very prominent 7th dan Shihan such as Horii Etsuji, Didier Boyet, Patrick Benezi, Greg O’Connor, and Lilou Nadenicek also contributed to keep the bar very high indeed on the mat. Anyone who wished could go and spend some precious time taking ukemi from them and throwing them. 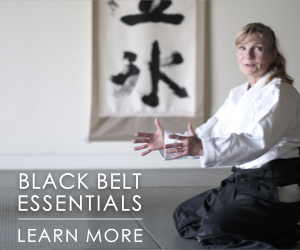 Micheline Tissier Shihan, who could not train due to an injury, showed her support by observing a number of classes. It was a real pleasure to talk to her again as the last time I saw her was back in 2016 when I interviewed her during the Congress of the International Aikido Federation. The organization was actually present to support the event and was represented by its General Secretary, Wilko Vriesman Shihan. I am always fascinated by the amount of enthusiasm that all of these very experienced sensei still show for aikido. One would think that it would be easy to enter a sort of routine after so many years and so many seminars, but all display an unrelenting dedication to the art. You can of course tell by the way Miyamoto Shihan gets excited during the practice, or when Tissier Shihan jumps on any occasion to show you something he has recently discovered, but it was illustrated particularly evidently to me a little before the Saturday class, when I saw Christian Tissier and Patrick Benezi quietly discussing Christian’s more recent way to perform katatedori kokyu-ho and trying things on each other. 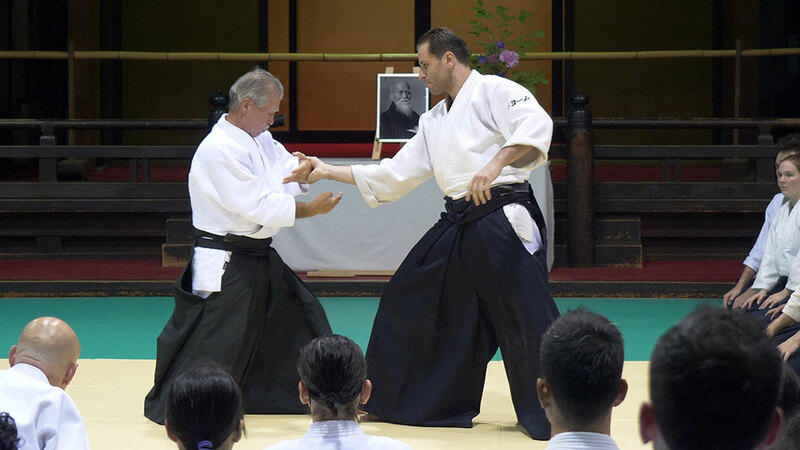 Both have known each other for over 40 years, but they still discuss and train in aikido together. This is both an inspiration and a sharp reality check for me when I catch myself feeling blasé about things. On Sunday, as I was walking around the dojo taking some videos, I heard someone call my name from afar and saw Kimura Jiro Shihan and one of his students in attendance. Kimura Shihan was promoted to the 8th dan Aikikai by Doshu at the same time as Miyamoto and Tissier Shihan. I had never talked to him directly but he seemed to know everything about me and what I did. A very friendly discussion followed, which confirmed the very positive description that all those who know him had given me. On Saturday night, a special reception was held in a modern restaurant close to the Butokuden and provided further opportunity to mingle and get to know each other. A series of touching and witty speeches were given by our hosts, and by the two Shihan. 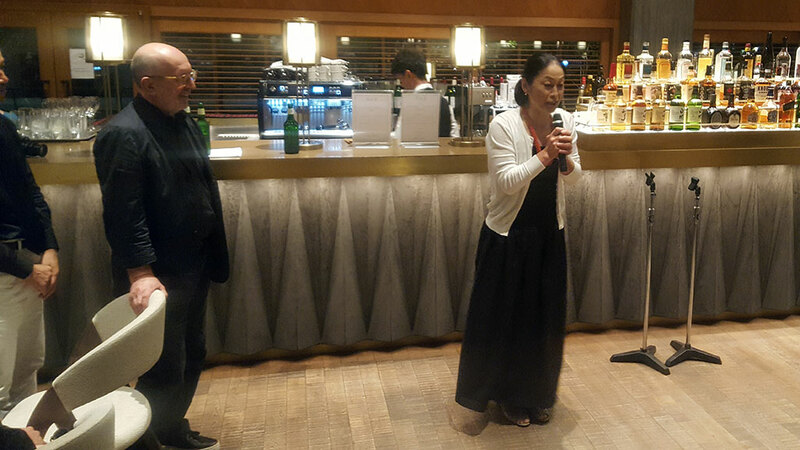 I would like to also mention the fact that Horii Shihan decided not to speak, but instead, to sing the song “Paris” by Edith Piaff to honor the guests, a performance that was received with thunderous applause. As always, I extended an offer to Okamoto Shihan to document the event and she kindly allowed me to shoot photos throughout the weekend. Given the logistical challenge, Jordy Delage, who was here to practice and to conduct an interview with Tissier Shihan for his company Seido, kindly proposed that we share our gear and footage in order to deliver the best possible material, so that those who could not attend could get a glimpse of the atmosphere and the personality of the teachers present. In hindsight, this seems quite representative of the general collaborative atmosphere that infused the whole weekend. 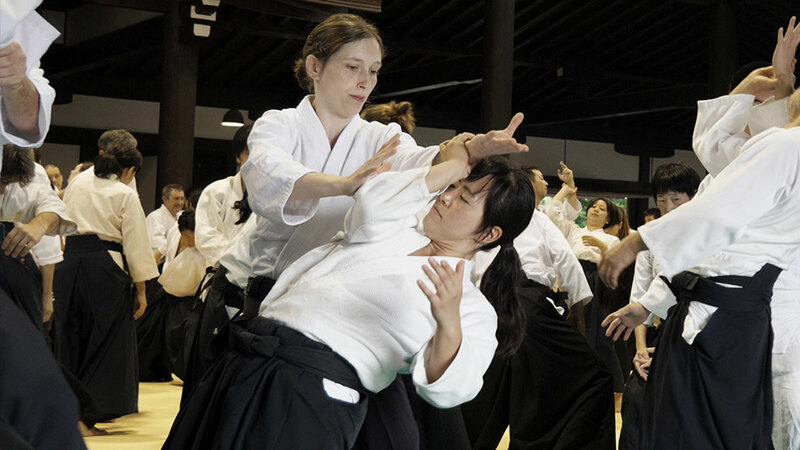 All attendees left the event with much to chew on technically, but also with a sense of how aikido can bring people together in spite of differences in language, culture, and style. The fact that, in spite of their very long careers and differing paths, those teachers still manage to meet and share while focusing on the common principles that govern our art, is inspiring and a wonderful example for us all. The next seminar will take place in early June 2019 and I can’t encourage you enough to come to Japan to share some very special moments with us. 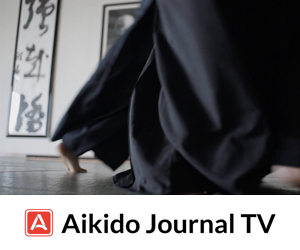 A very special thanks to Guillaume Erard for covering this event for Aikido Journal. Nice article. It seemed like a marvelous event. I was there! Absolutely amazing and intense seminar. I can not wait to watch the videos and interviews of the shihans. Merci Monsieur Erard! Very inspirational, I would love to attend this seminar in the future. It looks like a wonderful event. It’s nice to see more collaboration in aikido.